The Hudson Crop Claims Team is dedicated to providing superior claims service to our customers when a loss has been reported. We are available to quickly and accurately address claim issues when the need arises because we utilize both full-time employee and contracted adjusters. Our well-trained adjusters are equipped with mobile work stations to upload and settle a claim from anywhere. This technology includes remote wireless internet access, tablet processing technology and on-site scanning and printing technology. When the adjuster has completed the claim paperwork, the information is sent to the claims processors for rapid payment. Notification must be received by Hudson Crop within 72 hours of the initial discovery of damage. Assemble and review all documents in a timely manner to avoid delays in processing the claim. Cooperate with the investigation and the adjuster. Every claim is subject to audit after receipt. The crop insurance agent cannot be involved in the claims process. Supervision, control or adjustment of a claim. Obtaining sales or production records for purposes of loss adjustment on behalf of the policyholder. Assisting the insured with separating the production between units and subsequently providing such records to the adjuster to use in completing the claim forms. Contact your crop insurance agent immediately upon discovery of damage to your crop that will adversely affect the yield or value of your crop. Notification must be received by Hudson Crop within 72 hours of the initial discovery of damage. Make reasonable attempts to protect damaged crops from any further damage. If any part of your loss is due to abandonment or poor farming practice, that portion of the damaged crop will not be covered under your policy. Notify and obtain consent from a Hudson Crop authorized representative before and after destroying any of the insured crop that will not be harvested, putting the insured crop or acreage to an alternative use, or abandoning any portion of the insured crop. If you do not intend to plant the insured crop during the late planting period, notification must be provided to Hudson Crop within 72 hours of the final planting date. 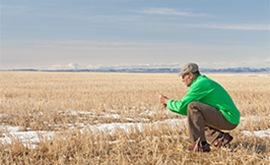 Your crop insurance agent cannot be involved in the claims process. We are required by the RMA to pay your claim within 30 days, provided an agreement has been reached and you have complied with all policy provisions. Upon notification of a loss, adjuster will contact the grower to schedule an appointment to examine the crop and collect the information required to accurately and efficiently review the claim. Our adjusters are equipped with mobile work stations that allow them to upload and settle a claim from any remote location. Once paperwork is complete, the information is sent to the claims processing department for rapid payment. Get claims assistance around the clock with our 24/7 claims hotline. (855) 550-6825.